A referendum on the impeachment of the President of Romania, Traian Băsescu, was held in Romania on July 29. This referendum was required to ratify the decision of the Romanian Parliament, on July 6, to impeach President Băsescu who has been in office since 2004. The constitution allows for the President to be impeached only for grave misdeeds, but this clause has been abused by Băsescu’s political enemies who had already tried to impeach him (unsuccessfully) in 2007. Since January, Romania has been rocked by major political instability. The country’s politics have been bitter and sulfurous since at least 2009, and at the root of it all is Băsescu himself. The President quickly alienated most of his former political allies after being elected to the presidency on a centre-right, anti-corruption platform in 2004. Băsescu has a very hot temper and is well known for his erratic and off-the-cuff style, which sometimes degenerates into foul-mouthed tirades against his opponents. He has not lived up to expectations on the matter of corruption, and he has been criticized for his authoritarian penchants. Băsescu survived a first attempt by the opposition to impeach him on fairly flimsy grounds in 2007, when three-quarters of the 44% who turned out voted against removing him from office (even if the referendum had been valid – it had a 50% turnout threshold – Băsescu would not have been removed from office). Relations between Băsescu’s centre-right Democratic Liberal Party (PDL) and the opposition – both the Social Democrats (PSD) and the National Liberals (PNL) worsened following Băsescu’s narrow reelection in 2009 with only 50.3% of the votes in a disputed runoff election. Romania is a semi-presidential republic, with the President holding responsibility over foreign affairs as well as the power to appoint judges or to delay legislation. Between 2008 and 2012, his Prime Minister was Emil Boc, a member of the PDL. Boc governed in coalition with the PSD until 2009, when his first government was taken down by a no-confidence motion backed by the PSD, the PNL and the Hungarian minority party (UDMR). Following Băsescu’s reelection, he renominated Boc instead of nominating a candidate backed by the three parties which had voted the no-confidence motion. However, Boc managed to obtain Parliament’s confidence in December 2009, thanks to the support of the UDMR and dissidents from the PSD. In office, Boc wrestled with the economic crisis. Romania fell into recession in 2009 and again in 2010, and since then the country’s economic recovery has been slow. While Romania remains the second poorest country in the EU, its economic situation – in a comparative perspective – is not all that bad. However, in 2009 Romania received a $27 billion bailout from the IMF, which came with strings attached. The Boc government implemented and became extremely unpopular for austerity measures, including budget cuts, wage cuts in the public sector and a sales tax hike. The government is committed to reducing the country’s budgetary deficit from 4.4% of the GDP in 2011 to 1.9% this year. The austerity measures associated with the PDL and Băsescu were extremely unpopular. Voters in the EU’s second poorest country were tired of tax hikes, wage cuts and decling public services; all with the backdrop of politicians and political parties which are widely seen as lining their pockets. Maybe austerity would have been better received if voters did not feel that their representatives were stealing their money. Several PDL politicians, including Băsescu himself, are suspected of corruption; but the opposition hardly has a better reputation. The PNL’s ranks include a corrupt oil magnate/billionaire, while the ex-communist PSD is seen as the epitome of the old corrupt clique – a coalition of old communist party bosses and security employees. There were major protests earlier this year, which ultimately forced Boc to resign on February 6. A few days later, he was replaced by a cabinet led by Mihai Răzvan Ungureanu, a former boss of the foreign intelligence services. However, on April 27, his government was voted down by a motion of no-confidence backed by the opposition. In February 2011, the three main opposition parties (the ex-communist centre-left PSD, the liberal PNL and the small right-wing Conservative Party) formed an electoral coalition, the Social Liberal Union (USL). Initially, in February, after Boc resigned, the leader of the PSD (and USL), 39-year old Victor Ponta, refused to become Prime Minister. However, after the Ungureanu cabinet fell, Băsescu was compelled to name Ponta, his top political rival, as Prime Minister. Romania was thus thrown into a French-like situation of cohabitation between an opposing President and government. However, unlike in France, Romanian politics – especially with a President like Băsescu who is known to be a prick – are far less consensual. Since taking office, Ponta and Băsescu have been embroiled in a bloody schoolyard fight. Things got extremely ugly at the end of June, after the courts – which Ponta claims are stacked with Băsescu’s allies – found Ponta’s political mentor and former PSD Prime Minister Adrian Năstase guilty in a corruption and fraud case. It was after this incident that the Parliament voted to impeach the President, accusing him of using the secret services against political enemies, refusing to appoint cabinet ministers, trying to influence prosecutors in criminal cases and engaging in illegal phone tapping. Băsescu has flatly denied these allegations, and regardless of their veracity, the case for his impeachment is constitutionally flimsy and is definitely politically motivated. In this schoolyard brawl, Ponta’s allies claims that Băsescu struck back by leaking a plagiarism scandal in which Victor Ponta is accused of plagiarizing his doctoral thesis. Ponta had the commission in charge of academic integrity dissolved and has said that he will not resign regardless of what happens in this case. After a fight with the courts and Băsescu over who from Ponta and Băsescu should have represented the country at a European summit, Ponta made his most controversial moves. He threatened to fire constitution court judges (he claims that they are Băsescu loyalists), fired and replaced the ombudsman with a party loyalist, seized control of the official journal and replaced the heads of both chambers of Parliament. These measures, which opponents claim are clear moves to weaken the country’s independent institutions, sent a chill down the spine of the European Commission and most EU grandees. The EU has struggled in the past year with the issue of Hungary – which presents a similar case of a European elected government disrespecting the rule of law and liberal democratic values. In Budapest, Prime Minister Viktor Orbán made controversial changes to the Hungarian constitution which has limited media freedoms and judicial freedom. The EC issued a stark warning to the Romanian government in early July, and Germany’s Angela Merkel minced no words in condemning Ponta’s actions. The EC has debated which sanctions, if any, should be adopted against Romania. A freeze in EU transfers was seriously considered, but the crisis has likely derailed or at least significantly delayed Romanian attempts to join the Schengen area. Unlike Orbán however, Ponta has not been defiant of European institutions and moved to soothe fears that he was staging something akin to a coup d’état. Ponta claimed that there had been misunderstandings, and reassured that he would withdraw his controversial laws if they were to cause any trouble for Romania in the EU. In 2007, the previous referendum on Băsescu’s impeachment was deemed invalid because turnout was below the 50% threshold required to validate it. Ponta tried to remove this quorum and allow for the referendum to be valid even if less than 50% of voters turned out. After protests by the courts and the EU, he was forced to reinstate the turnout requirement. Băsescu, denouncing a constitutional coup d’état and a grave threat to democracy, called on his supporters to boycott the referendum (with the hope that less than 50% of voters would turn out and invalidate whatever the verdict was). However, Băsescu was far more popular in 2007 than he is today. Local elections held in June saw his party, the PDL, win only 15% of the vote against 49.7% for the USL. The high prospect of the referendum both passing the turnout requirement and a majority of votes in support of Băsescu’s impeachment worried Romania’s European partners a lot. The EU would be forced to deal with the consequences of legitimate, free and fair referendum which was, however, motivated by a political turf war between two cliques and enemies. Such a result would have boosted Ponta’s power at home – it will still be boosted in November when the USL is the big favourite to win the legislative elections – by allowing for the election of a close ally of Ponta, perhaps the PNL’s leader and caretaker president Crin Antonescu. Turnout, however, ultimately fell just short of the 50% threshold. 46.53% of registered voters turned out to vote, but of these 46%, 87.5% voted in favour of removing Băsescu from office. If the law is to be followed, then the courts will not validate the results of this referendum and Băsescu will remain in office. This result is a brief respite for Romania’s European neighbors and political partners, who feared the consequences of 50%+1 turnout in the referendum. However, the political instability and acrimonious political situation has not, for that matter, ended. Băsescu was triumphant on July 29, styling the results of the referendum as a victory for democracy against the constitutional coup d’état and democratic transgressions of Victor Ponta. While he said that he would work to mend the “enormous rift in society”, he has refused to resign and shows no sign of shying away from his confrontational attitude against Ponta’s government. Băsescu’s allies have been eager to attack the current government, recently leaking a secret deal between Ponta and a shady trade union of ex-military men which seeks to scrap institutions such as the Constitutional Court. On the other hand, Victor Ponta has been similarly defiant. He has claimed that Băsescu has lost all legitmacy and should resign, and originally indicated that he would refuse to work with an illegitimate president (and it is true, in part, with such a large number of voters voting to impeach him, that Băsescu’s legitimacy is minimal at this point). The USL would like for the courts to validate the referendum anyway, claiming that some registered voters on the rolls do not live in Romania and haven’t voted in years. Regardless of what happens, it is a certainty that Ponta backed by the legislature and President Băsescu will continue their bloody schoolyard fight in the foreseeable future, given that Băsescu’s term will only end in 2014. Given that the President’s remaining base of support is hardly more than 15%, he did not “win” the referendum only by motivating his supporters to boycott the referendum. Against all expectations, however, less than 50% of voters actually voted. There are a number of factors at play here. The EU’s threats (to suspend transfer payments, or keep the country’s judicial system under supervision or even the nuclear option) likely played a role in demotivating potential opponents of Băsescu. There is certainly an element of political apathy at play as well, boosted by the timing of the referendum (in the middle of summer on a hot Sunday) but also traditional disenchantment with politicians and politics. The USL is the favourite to win the next election, but – at least in Romanian academia – there is little enthusiasm for it. Romanians do not political parties as political movements which represent them or work for the national interest, but rather as a grubby bunch of frontmen and corrupt oligarchs and ex-communist stooges. Neither party has a crystal clean reputation. Ponta’s controversial tactics, mixed with the very personal and partisan nature of this referendum and the EU’s surprisingly vocal reaction to all this, like played a role as well.The geography of turnout shows that there is a clear partisan element at work, given that turnout was lowest (below 40%) in Transylvania, where Băsescu’s centre-right party is usually the strongest. However, the lowest turnout levels were in Harghita and Covasna counties, at barely 11.6% and 20.6% respectively. Both of these counties are heavily Hungarian (over 70% of the population). Hungarian Prime Minister Viktor Orbán made a controversial entrance in the referendum campaign by calling Hungarians in Romania to boycott the referendum as well. Orbán’s controversial intervention was strongly condemened by Ponta, who claimed that Orbán was intervening in Romania’s internal affairs. This referendum was, from a certain perspective, a no-win scenario given that a victory would have caused nightmares for the EU and cemented Ponta’s power, while its defeat means that the power struggle between both men will continue unabated, condemning the country to months of a bloody power struggle between two enemies who occupy the top two political offices in the country. Elections to the new General National Congress (GNC) were held in Libya on July 7, 2012. These elections are the first elections of any kind held in Libya since 1965, but most importantly are the first elections since the overthrow of Muammar Gaddafi, Libya’s long time authoritarian ruler, in the Libyan Revolution/civil war last year. Since the beginning of the uprising in February 2011, Libya has been ruled by the National Transitional Council (NTC) which slowly became, in the eyes of most foreign countries, the sole legitimate government of Libya during the civil war against the Gaddafi regime. The NTC has officially assumed both executive and legislative powers during this interim period, which is scheduled to end with the election of the GNC which was, at the outset, tasked with appointing a constituent assembly (from outside its own ranks) which would have a 120-day period to draft a new constitution for Libya which would then need to be approved through a popular referendum. However, right before the election, the NTC seems to have said that the GNC will not have the power to appoint this constituent assembly which would instead be elected directly by the people. It is yet uncertain if the GNC will ultimately appoint the constituent assembly, given that the NTC’s decree was not well received and that the new members of the GNC seem to fancy appointing the constituent assembly. Otherwise, the GNC will have the responsibility of appointing a Prime Minister and later the promulgation of the new constitution. Under Gaddafi’s regime, Libya had no parliamentary institutions to speak of because the Gaddafist ideology resented representative democracy and claimed to prefer ‘direct democracy’. Hence, on paper, Libya under Gaddafi was a direct democracy in which the ‘masses’ held power. In reality, of course, all power laid in the hands of Gaddafi and his inner circle of sons, family relatives, crooks and thugs. Under Gaddafi’s 42-year rule, any public institutions common to most other countries – even if they are not liberal democracies – were hollowed out and there was no civil society outside of Gaddafi’s inner circle. This is a fairly unique situation, especially when compared to Tunisia and Egypt. Both Tunisia and Egypt were authoritarian regimes prior to the 2011 revolutions, but both had actual representative institutions (even if they were practical jokes) and a semblance of ‘normal’ political life with some civil society structures and election-like events even if they were heavily rigged and controlled. The new GNC will have 200 members. Working out the electoral system for these elections took quite some time and was a fairly controversial process in Libya. These elections used a parallel voting system with an individual-based system and a party list-based system. 120 seats were elected using the individual system, using either FPTP in single-member districts or SNTV in multi-member districts. These individual seats will all be filled, legally, with independent candidates not affiliated with any political party, but nothing prevented candidates from being endorsed by a political party. The other 80 seats were elected using the party-based system, with the country being subdivided into primary districts and/or sub-districts which hold a certain number of seats elected by proportional representation based on closed party lists (but parties did not need to field 80 candidates). There is a gender quota on the party lists, requiring that party lists alternate between men and women. The shape of these various districts is fairly hard to comprehend; other sources such as the POMED do a much better job than I at explaining its intricacies and detailing each district’s composition. Basically put, for the PR segment, you had primary districts – and some primary districts divided into sub-districts – which were allocated a varying number of party-based seats. The primary districts or sub-districts were then divided into secondary districts, which elect one or more individual (independent) member by FPTP or SNTV. Some districts did not have individual-based seats; others did not have party-based seats. Overall, according to the POMED’s article, 105 seats out of the 200 seats in the GNC will be from Tripolitania (western coastal Libya – Tripoli), 60 seats will be from Cyrenaica (eastern coastal Libya – Benghazi) and 35 seats from Fezzan (southern Libya). These three regions are the country’s historical regions since the colonial era, and regionalism is and has always been a potent political factor in Libya. The monarchy which ruled Libya from independence in 1951 until the Gaddafist coup in 1969 was, on paper, a federal regime (until 1963). However, Gaddafi’s regime was effectively extremely centralized and power relations based heavily on clans and tribal relations. From the outset, regional conflict has opposed Tripolitania – the most populated region – to eastern Cyrenaica, which on the other hand holds most of Libya’s oil reserves. 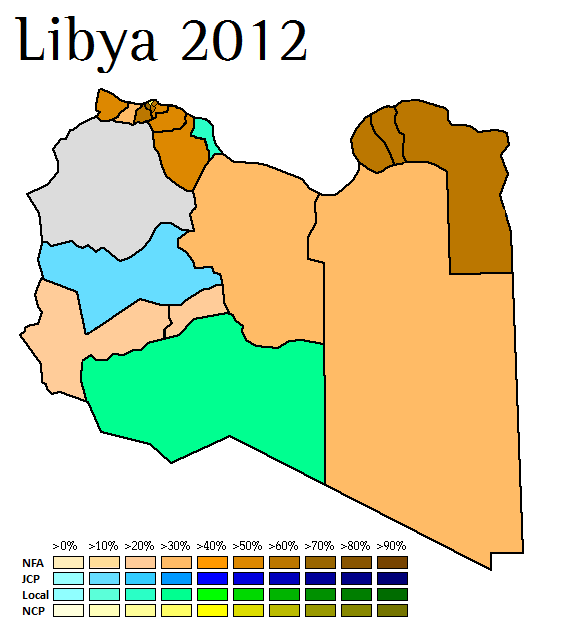 Cyrenaica was a stronghold of opposition to Gaddafi and was the first base of the Revolution as early as February 2011. Since the collapse of the Gaddafi regime in October 2011, some easterners have been vocal in demanding major decentralization or federalism. Some went as far as to proclaim their own regional assembly for Cyrenaica, while some radical federalists boycotted these elections though they failed to disturb the voting in a significant manner. The regional tensions in the Benghazi region have been but some of the troubles faced by the NTC. There are powerful armed militias and local warlords in towns such as Misrata who have refused to lay down their weapons and adapt to peacetime circumstances. There are the remnants of well-armed Gaddafist militias which could turn the south into a no-man’s land. But while Libya’s future is, to be sure, difficult and very risky, it is not for that matter extremely sombre. Libya has not had political parties to speak of since the monarchy banned all parties following contested elections in 1952, which the main opposition claimed to have won. Similarly, all parties were banned under Gaddafi, who hated all forms of organized political action. Thus, unlike in Tunisia and Egypt which had political parties prior to their revolutions, Libyan parties are all new creations and though some may have an history as opposition movements, few if any of them had a strong grassroots presence in one form or another prior to the Revolution. The two main parties which emerged were the National Forces Alliance (NFA) and the Justice and Construction Party (JCP). The NFA is a coalition of parties and groupings led by Mahmoud Jibril, who served as the NTC’s Prime Minister between March and October 2011. Prior to this, Jibril had been a fairly high-ranking official in the old regime, working closely with Saif al-Islam Gaddafi as head of an economic development board which led the old regime’s attempts, between 2007 and 2011, to open up to the west and liberalize the Libyan economy. Jibril was something of a pro-western liberal technocrat during that period – which now seems like almost surreal given how Gaddafi turned out – in which the old regime tried to cozy up with its old western enemies and become a major economic partner for them. Jibril quickly defected and headed the NTC until the fall of Sirte and the Gaddafi regime last fall. By quitting the NTC last fall, Jibril made a smart political move in moving away from the NTC, which has since become quite unpopular. The NFA is allied with the National Centrist Party (NCP), an ideologically similar party led by academic and former NTC cabinet minister Ali Tarhouni. The NFA has been presented as a secular, liberal party. It is true that the NFA appears to be a liberal party – at least on economic matters, unsurprising given Jibril’s résumé. However, it can only be described as secular and liberal within Libya’s very conservative political culture. We’re not dealing with some European liberal party which is going to legalize drugs and gay marriage tomorrow morning. Jibril has not styled himself as a secular leader and the NFA openly accepts an Islamic reference to the law. Thus, while the NFA endorses sharia law, it is, within Libya’s very conservative and religious political culture, considered the most liberal and secular option compared to the other main party, the JCP. On economic matters, the NFA is fairly liberal. The Justice and Construction Party (JCP) is the political wing of the Libyan Muslim Brotherhood (MB), similar to Egypt’s Freedom and Justice Party. The MB in Libya has been heavily influenced by the much more prominent Egyptian Brotherhood. Indeed, the Libyan section of the MB was basically born as a result of the exile of Egyptian MB leaders to Libya during the Nasser regime, during which they found a sympathetic host in Libya’s King Idris. The exiled leaders of the Egyptian Brotherhood gained significant power in Libyan academia during the monarchy, and built a large group of followers who could go on to form a Libyan section of the MB in the early 1960s. However, they were quickly forced underground by Gaddafi after the 1969 coup. Until 2005-2006, the Libyan MB developed in exile – notably in the US, while inside the country the regime led cracked down on the group. In 2011, the MB played a fairly prominent role in the civil war. The JCP has been divided on the attitude it should adopt vis-à-vis its Egyptian ‘brother’ – should the party pursue a pan-Islamic agenda or act in a more nationalist and isolationist vein? Some have claimed that the JCP would be hurt by being too close to the more powerful Egyptian FJP, given what appears to be an underlying current of nationalism in Libya which is somewhat suspicious of Egypt and Egyptian motives. The JCP is led by Mohammed Sawan, a prominent leader of the MB and a victim of the old regime’s 1998 crackdown against the MB. The NFA and the JCP emerged as the two main political forces, the NFA benefiting from the personality of its leader and the JCP benefiting from the fairly good local implantation of the Libyan MB in some parts of the country. But there are hundreds of other parties. The most important of these parties is the National Front Party (NFP). The NFP is the political wing of an old rebel group founded in the 1980s, the National Front for the Salvation of Libya (NFSL). The party’s leader is Mohamed Yousef el-Magariaf, the former leader of the NFSL. An ambassador to India, Magariaf broke with the old regime in 1981 and founded the NFSL. During the 1980s, the NFSL, working in tandem with the CIA and other foreign countries including Egypt, Tunisia and Saudi Arabia, led several violent attacks against the regime in unsuccessful bid to overthrow Gaddafi. 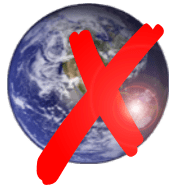 Backed – allegedly – by the CIA, the NFSL attempted to assassinate Gaddafi in 1984 but failed, after which the NFSL slowly abandoned its most violent actions. However, it refused Saif al-Islam Gaddafi’s overture towards past opponents and enemies of the regime in 2005-2006. The NFP’s ideology is unclear, but while it accepts sharia law, it appears more nationalist and secular-oriented than outright Islamic. The NFSL’s main base was in Cyrenaica, but it has been said that it is popular with Libya’s Berber population in the west (mountains south of Tripoli) – who had long been opponents (and victims) of Gaddafi. The Chairman and Prime Minister of the NTC since last fall are both former members of the NFSL. Mahmoud Jibril’s NFA emerged as the surprise winner of this election, taking what seems to be close to 60% of the popular vote for the party-list votes. These elections were the first partisan elections in Libya since 1952 and probably the first free elections in the country’s existence, hence it was very hard for observers to assess and evaluate the chances of the various parties. Based on the Tunisian and Egyptian precedent and Libya’s prevailing religious conservatism, most had assumed that Mohammed Sawan’s JCP would win fairly handily. What can explain the Islamist defeat in Libya after their victories in Tunisia and Egypt? Firstly, I think it is important to recall that unlike Ennahda in Tunisia and the MB/FJP in Egypt, no party in Libya had a comparable level of implantation on the ground prior to the fall of the ancien régime. The MB has never been an extremely powerful political actor in Libya, it did not lead the Revolution last year and its grassroots – though they are strong compared to other Libyan political actors – remain fairly weak. However, at the same time, it is not like the NFA started out with especially strong grassroots either. Secondly, Libya’s revolution was completed only through a bloody and protracted civil war – which did not happen in either Tunisia or Egypt. One of the main leaders of this civil war/revolution – Mahmoud Jibril – was the leader of the winning coalition who, despite his past links with the Gaddafi regime, remained very popular and his decision to quit the NTC last fall was a move of genius. Jibril’s opponents, Sawan first and foremost, attacked him for his links to the old regime and Sawan styled Jibril was being “worse than Gaddafi”. However, it appears as if most voters did not hold his past career under the dictator against him. Fairly understandably given that Jibril was nothing more than a western technocrat who defected very early and is not seen as having blood on his hands. After all, a lot of the new Libyan leadership worked, in one way or another, with the old regime. Thirdly, the political culture in Libya is different to that found in Tunisia or Egypt. In both of these countries, the political role of Islam is a controversial matter. In Libya, however, the place and role of Islam in government is a foregone conclusion, and all parties – including the ‘secular liberal’ NFA and NFP – accept an Islamic reference to the law. Hence, the JCP could never establish itself as the unquestioned representative of political Islam or boast its Islamic credentials. Similarly, the victory of the ‘liberals’ is only a victory for the liberals and moderates within a Libyan context. Even in Egypt and Tunisia, I doubt the NFA would be considered a secular party. Given that 120 seats will be held by independents while only 39 seats will be held by Jibril’s party, it is hard to describe this as a victory for the NFA. The presence of a majority of independents in the GNC means that the shape and colour of the next government is very much up in the air, and extremely uncertain. While both the NFA and JCP endorsed individual candidates, the JCP has boasted that it benefits from a strong base of support with them. The party’s leadership has not specified exact numbers, but around 25 of the individual members are said to be close to the party – which, in the end, isn’t all that much out of 120. The JCP and its leader, Mohammed Sawan, showed themselves to be openly hostile to the NFA and Jibril during the campaign, even if it accepted defeat fairly quickly and honourably. In recent days, it seems as if Sawan and the JCP might have backtracked and conceded that it will need to work with the NFA in the formation of a new government. Besides the NFA and JCP, other parties did extremely poorly given how most of them had high expectations for themselves. The NFP won only two seats, both of them in Cyrenaica. It is quite likely that the NFP, which could become a small ally for the NFA, was hurt by its association with the unpopular leadership of the NTC. One party which did extremely poorly was the Homeland Party, a fairly ‘radical’ Islamist party led by prominent cleric Ali al-Salabi and Abdel Hakim Belhaj, a former leader of the Libyan Islamic Fighting Group (LIFG) under Gaddafi. Belhaj, who served as head of the Tripoli military council during the civil war, was in jail under the old regime (until the LIFG entered a dialogue with Saif al-Islam in 2009 and 2010) and claims to have been handed over to Gaddafi by CIA agents. The Homeland Party rejects the Salafist or radical label and claims that it is an inclusive religious party, but it has been described as fairly conservative and radical and the question of the LIFG’s presumed ties to al-Qaeda in the past are a matter of concern. The Homeland Party hoped to win as many as 27 seats in the GNC, in the end it won no seats whatsoever. At a constituency level, it is quite remarkable how the NFA managed to bridge the regionalism of Libyan politics by winning very strong results in both Benghazi (Cyrenaica) and Tripoli (Tripolitania). The federalists in Cyrenaica saw their boycott fall flat on its face and its attempts to severely disturb the voting process similarly failed. The only major city where the NFA performed poorly is Misrata, where the NFA won only 8.8% of the vote and a single seat. In Misrata, the Union for the Homeland, a party led by former Gaddafi opponent Abdul Rahman Swehli. The party rejects federalism but supports major decentralization. Swehli’s group appears to be a national party – it won another seat seat in al-Aziziya just outside of Tripoli – but it is strongest in Misrata, the country’s third largest city and a fairly rebellious city since the fall of Gaddafi. Local authorities in Misrata have often defied the NTC, and it seems as if its voters feel similarly independent. A regional party – the Wadi al-Hiya Party for Democracy and Development – won two seats on 35.8% of the vote in the Ubari sub-constituency in Fezzan (where the NFA seems to have performed poorly). In Tripoli, the NFA won 9 seats overall against 4 seats for the JCP. Two minor parties won a seat each, while Ali Tarhouni’s NCP won a seat in the Hay al-Andalus district of the city with 35.4%. In Benghazi, the NFA took 7 seats (64.5% of the vote) against 2 for the JCP (11.4% of the vote) and one for the NFP (a small party won the last seat). Libya’s future remains unclear, but it appears to be on an encouraging track. This election was a success, finally undisturbed by endemic violence and turf wars which have weakened the NTC since Gaddafi’s fall last October. The question of who will get to decide on the membership of the constituent assembly which will draft Libya’s new constitution will probably become a very thorny political issue, given that the NTC removed this power from the GNC but the GNC would probably like to keep this precious power. Even if Libya’s path to potential liberal democracy has a great many obstacles and the country’s stability faces very serious threats, in retrospect, the results of this election seem to confirm that it really was ‘worth it’ to get rid of Gaddafi. Like in Tunisia, Egypt and Syria; there seems to be real appetite for fundamental change (but perhaps not democracy as we know it or like it) in Libya. Finally, from a purely psephological perspective, it is always fascinating to follow elections in countries which haven’t held free elections in decades.